DELIGHTFUL HOLIDAY COTTAGE LOCATED IN OWNERS GROUNDS WITH HOT TUB The property is approached through the countryside and set in a village just outside of Ely. Renovated in 2016 and offering stylish accommodation with far reaching views over the countryside. Situated in the heart of the Cambridgeshire countryside the property is an ideal base for those looking to explore the surrounding area with many pretty villages and miles of country lanes to wander down. Slightly further afield is the ancient Cathedral city of Ely great for shopping along the pretty streets Cambridge with the stunning university buildings including Kings College and the river for Punting the Wildfowl and Wetlands Trust at Welney and Newmarket home of horse racing. London is a short train ride away. For shopping head to Ely or Cambridge both with great shopping theatres and cinemas and places to eat. Leisure facilities: hot tub. Guests entering into the property all on one level an entrance porch way housing the fridge/freezer leading through to a spacious open plan kitchen/lounge/dining area with exposed timber beam a well equipped kitchen having an electric oven and gas hob dishwasher microwave washing machine/dryer and filter coffee machine. A lounge area with wall mounted TV books and games comfortable leather sofas the dining area having table and chairs. From the open plan kitchen/dining/lounge area a hallway leads through to small office/study area. The master double bedroom has French doors leading to the garden a further double bedroom and a single bedroom with built in wardrobe. The family bathroom comprises of a free standing bath a separate shower cubicle WC and wash hand basin. 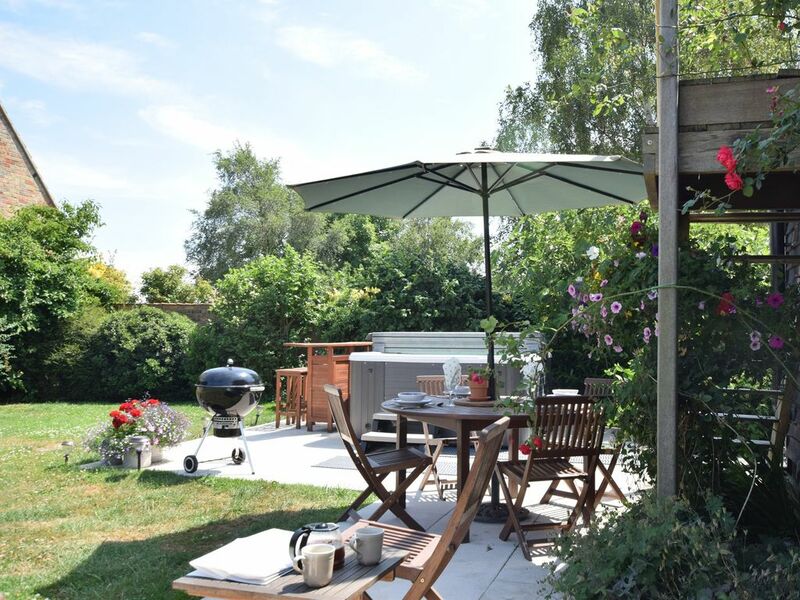 Outside: An enclosed garden with views of the countryside a patio area with hot tub garden furniture and BBQ perfect for relaxing and alfresco dining. To the front of the property is ample off road parking.